Have you thought about locking in a Bangkok vacation package? It's a breeze with Expedia, and you'll be able to buy some nice meals or gifts for your friends back home with the money you save. Wouldn't it be nice to earn savings up to 40,450 YEN*? Purchase your group's package deal on Expedia today! With more than 400 partner airlines and 321,000 properties to mix and match from on our extensive database, you won't have any problems crafting your perfect vacation. Almost ready to go on your Bangkok vacation? Can't decide what things to include in your travel itinerary? No need to fret — we're here to give you a few of our recommendations. Got cash to spend? Search for unique keepsakes and score some choice bargains at Pratunam Market. Visitors in this destination have an abundance of choice. Temples have long appealed to pilgrims seeking spiritual enlightenment in a complex world. Explore the holy site of Wat Saket and have your own mystical experience. Still got time to spare? Built to honor the gods, temples offer a captivating peek into another culture and religion. Learn about the local faith as you wander around the sacred monument of Wat Suthat. Life is either an incredible adventure or nothing at all, so why not plunge into some new and thrilling experiences? 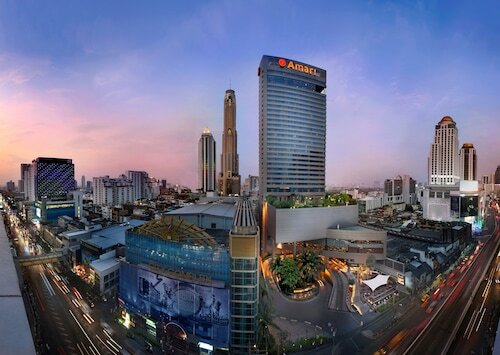 For more things to do, take a look at our Bangkok things to do page. Got Bangkok in your sights? 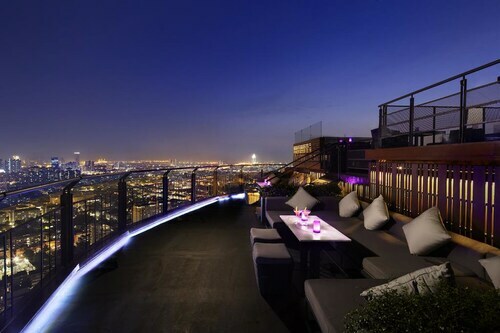 You're traveling to the capital of Thailand, so you'll definitely have a huge range of accommodations to select from. Book your room today on Expedia for the best rates on luxury getaways and cheap vacations! This “anything goes” street is a hot spot for budget travelers who want to buy cheap clothes and souvenirs, people-watch or party all night. The majestic European/Asian-style complex was once the home of the kings of Siam and is now both a place of worship and a must-see Bangkok landmark. The high, Khmer-style tower of the “Temple of Dawn” is one of Bangkok’s most photographed landmarks... at sunset! The “Temple of the Reclining Buddha” is the largest temple in the country and has more Buddha statues than any other Thai temple. Admire the house and art collection of an American expat who became one of Thailand’s most renowned “farangs” before he mysteriously disappeared in the 1960s. Known by locals as the “Lung of Bangkok,” this green breathing space provides a quiet haven for rest, sport and recreation to residents and visitors alike. A statue of a Hindu deity sits in the busiest part of the modern city, and receives offerings from millions of people each year. Head to this ancient temple and you’ll also find the Golden Mount, a structure that offers panoramic views as a reward for climbing the 318 steps to the top. Journey through the various stages of Thailand’s history at the home of the nation’s biggest art and crafts collection. 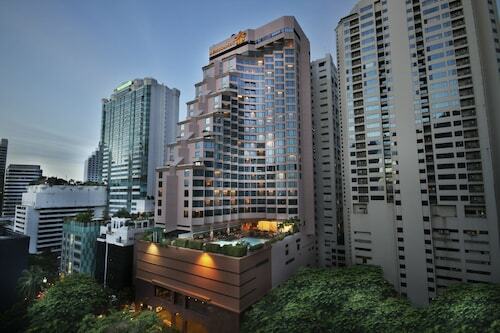 This family-friendly Bangkok hotel is located on a river, within a 10-minute walk of Bangkok Riverside and State Tower. Iconsiam and River City Shopping Complex are also within 1 mi (2 km). Saphan Taksin BTS Station is only a 3-minute walk and Surasak BTS Station is 12 minutes. Located in Sukhumvit, this luxury hotel is within a 15-minute walk of Soi Cowboy, Terminal 21 Shopping Mall, and Emporium. EmQuartier and Nana Square are also within 1 mi (2 km). Asoke BTS Station is 10 minutes by foot and Sukhumvit Station is 12 minutes. Situated in the city center, this luxury hotel is close to Terminal 21 Shopping Mall, Embassy of India, and Benjakiti Park. Also nearby are Benjasiri Park and Embassy of Pakistan. Located adjacent to the Pratunam Market, this 34-story hotel is 3 blocks from the CentralWorld Plaza and 8 km (5 mi) from the Queen Sirikit National Convention Center. 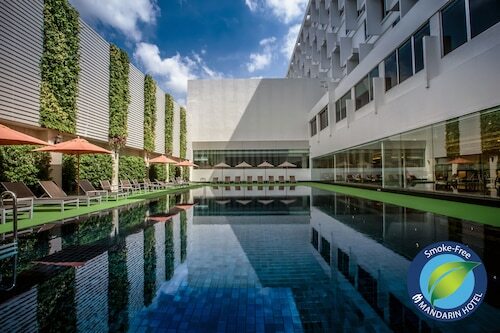 This family-friendly Bangkok hotel is located in the business district, within 1 mi (2 km) of Saint Louis Hospital, Patpong Night Market, and BNH Hospital. Lumpini Park and Bangkok Riverside are also within 2 mi (3 km). 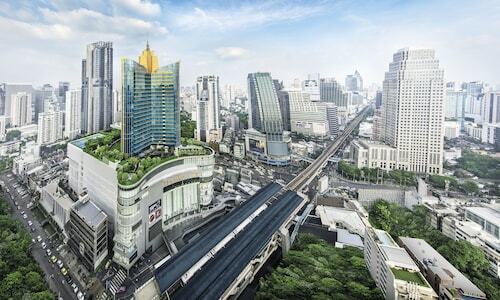 Akhan Songkho Station is only a 3-minute walk and Technic Krungthep Station is 9 minutes. Set on the banks of the grand Chao Phraya River, Anantara Riverside Bangkok Resort is a thriving oasis offering a unique way to experience the City of Angels.